A reaction wheel is an electrically-powered wheel aboard a spacecraft. 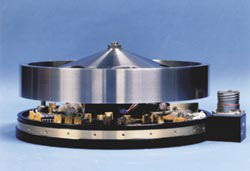 Typically, three reaction wheels are mounted with their axes pointing in mutually perpendicular directions. To rotate the spacecraft in one direction, the appropriate reaction wheel is spun in the opposite direction. To rotate the vehicle back, the wheel is slowed down. Excess momentum that builds up in the system due to external torques must be occasionally removed via propulsive maneuvers.